Experience surfing in the Mediteranean ! Wakesurf There is 1 product. 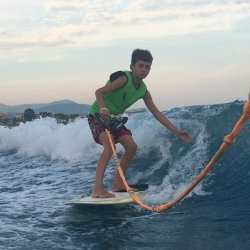 The Wake Surf in Bay of Angels in French Riviera in France ! Near Nice and Antibes, Glisse Paradise Watersport offers nautical activities during your holidays. Big Waves with our boat Mastercraft X10 !